Nvidia has revealed a new deep-learning based approach to removing noise, artefacts, text and similar unwanted aspects of photos. The green team's researchers collaborated with others from Aalto University and MIT and will present this new grain removal tool at the International Conference on Machine Learning in Stockholm, Sweden later this week. Interestingly, this new approach to de-noising hasn't been trained by showing example pairs of noisy and clean images. 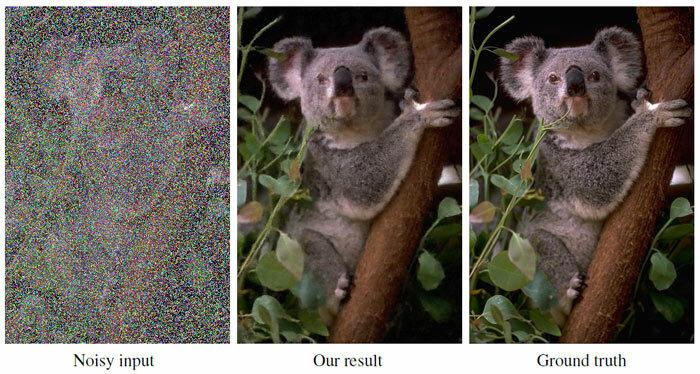 "Without ever being shown what a noise-free image looks like, this AI can remove artefacts, noise, grain, and automatically enhance your photos," the researchers claim. Furthermore, the researchers say that this new approach requires less training time and can be faster in execution. In the video above you can see the de-noising AI in action. It is worth a watch, as the AI is put through its paces on various photo examples and use cases. You will see the deep learning based de-noising method remove noise of various types, from various inputs. The technique isn't just good for old photos or those taken in low light, fast renders, or MRI images, it can spruce up images corrupted with text and similar overlaid shapes/colour blocks too. For training purposes the researchers leveraged Nvidia Tesla P100 GPUs with the cuDNN-accelerated TensorFlow deep learning framework. 50,000 images from the ImageNet validation set were used in training. I worked in print design for over a decade and the studios were often supplied very rough or sub-optimal images digitally or on hard copy. Perhaps this Nvidia AI will be useful for this industry, where you often have to make the best of what you have been given by a client but they expect beautiful, sharp, detailed images to roll off the press. It certainly looks more useful than Adobe Photoshop's standard de-noising and related tools that I am (was) used to. Summing up what the new technique offers, the research team wrote "Our proof-of-concept demonstrations point the way to significant potential benefits in these applications by removing the need for potentially strenuous collection of clean data." Importantly, we must remember the 'CSI vs reality' caveat; "Of course, there is no free lunch – we cannot learn to pick up features that are not there in the input data – but this applies equally to training with clean targets." The research team's presentation will take place at the ICML on Thursday. Meanwhile, you can read about the research in greater depth by downloading the paper (PDF). Oh,that sounds very useful indeed! Another AI project that makes images look more like the training set. I was OK until I saw the random text removed, what if some text was supposed to be there? QUESTION: has the US/UK government been using such tech since 90s considering the array of movies we have been watching or was it just a futuristic hoax? Meh, the idea that the speed of light is the limiting factor affecting speed of travel in the universe is also a lie. Whaddya gonna do? o great so now u can easily steal peoples watermark images and just remove it ..